I love scouring the menu on the internet before I get there, I love settling in to a cozy booth with a bread basket, and I even love sitting at the bar with a cocktail while waiting for a table. But sometimes there’s nothing better than having someone bring food over to enjoy with a glass (read: entire bottle) of wine. On Friday, my dear friend Vassaly proposed a dinner in and said she’d bring the food. The girl knows what I like. 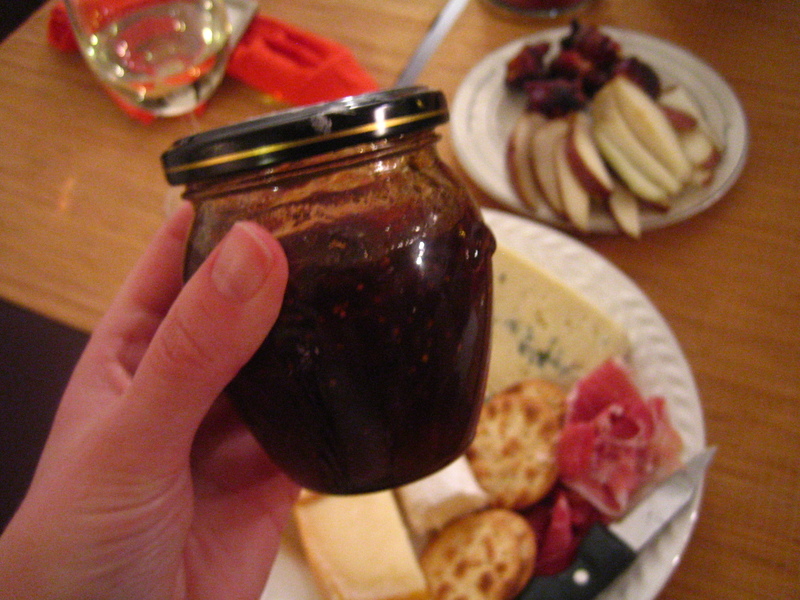 Fig preserves, because we’re fancy. A pear. I sliced it myself! I can be helpful sometimes. 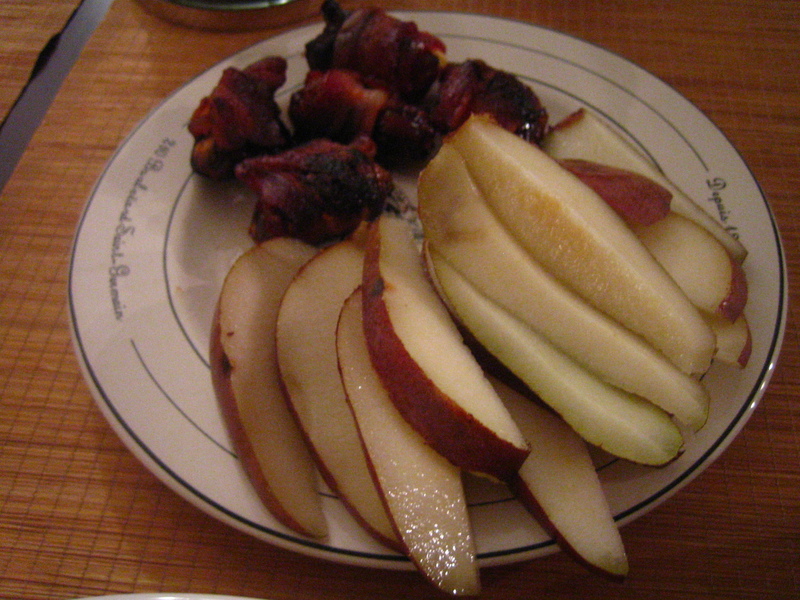 I also decided that I’d better throw in some bacon wrapped dates for when she arrived, because who doesn’t like stepping into an apartment that smells like bacon and hugs? 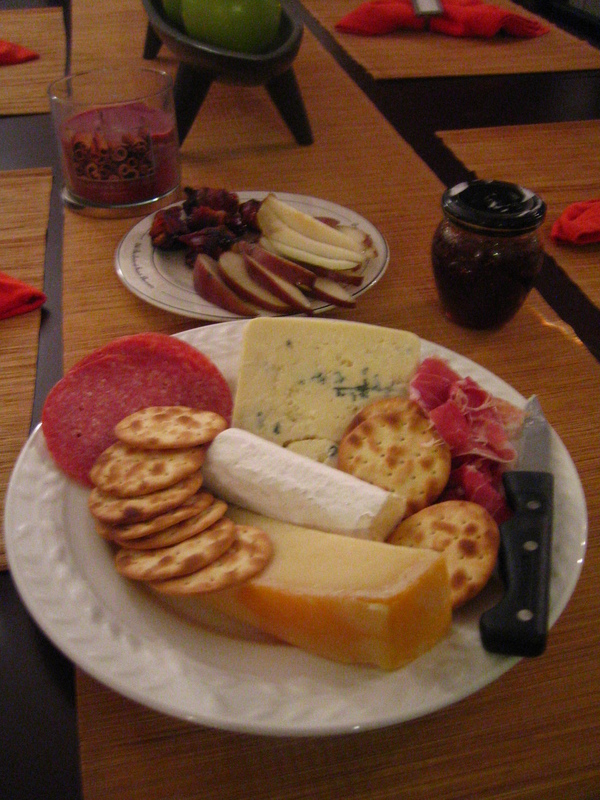 We had a goat gouda, a blue cheese and a brie log, plus salami and prosciutto with crackers. I’d say it tasted better with the company, too. Thanks, Vass! Not every day can be wine and cheese Friday, though. I was back to my standard whole grain/veggie dinner last night. 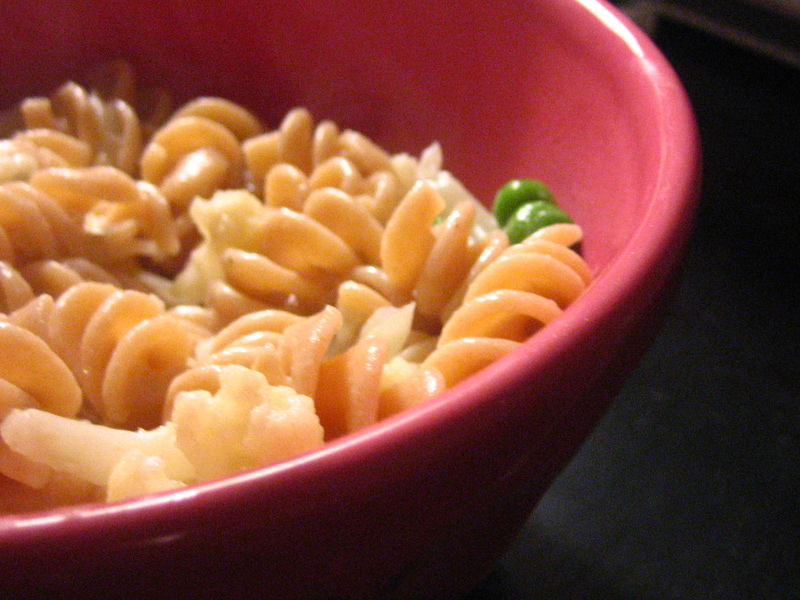 There may have been some leftover blue cheese in the sauce I made for my pasta, though. No point in going cold turkey, right? I will even bring booze. Ah, V is so sweet! 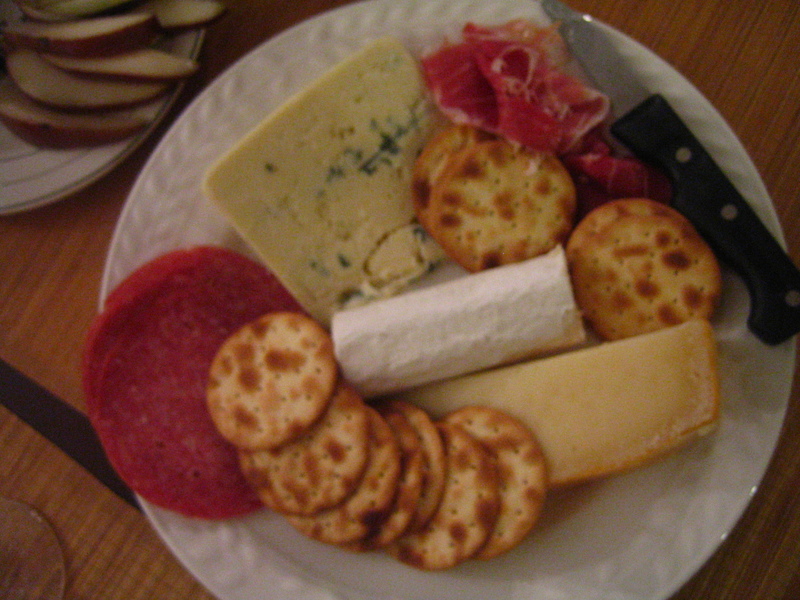 Cheese and crackers was actually a regular meal for me in college. Not good cheese, though… sadness. Shane and I do wine and small plates nights in every once in a while and I love them!! Mmmm wine and cheese make me oh so happy. And now I can have it again..wahooooo! This is indeed a perfect evening. I wish wine and cheese nights could happen every night, but perhaps you’re right — it’s like how the clouds make you appreciate the sun. Too philosophical? Mmmmm fancy cheese! Cheese is my favorite appetizer. Also, bacon and hugs? Count me in. Right? How could that not be a good time? I could live solely off wine and cheese. That’s a fact. I’m also a huge fan of restaurants. I love the whole experience…Cocktails at the bar, bread basket, the whole works. I say we pick out place and get dinner already, yes? um, yeah, so that is my idea of a perfect evening! what wine did you have? We had a Kendall Jackson sauvignon blanc and then some tempranillo that I picked up from Trader Joe’s… La Granja, I think? That was a very lovely dinner. And yes I did enjoy to bacon and hugs!